Tens of thousands of Hong Kong citizens converged for a week-long mass protest in support of Hong Kong Television Network (HKTV), which was recently denied a license by the Hong Kong government. Celebrities, HKTV staff union members, and pan-democratic groups all rallied outside government headquarters from Oct. 20-26. Organizers estimate that over 100,000 participants showed up to advocate for the popular television network, which had to lay off 320 staff members after the government refused to grant the license. The protesters demanded that the government explain itself, since it gave licenses to two other stations, i-Cable and PCCW’s Now TV, and did not give a clear reason for denying HKTV. The union plans to rally again in a few days, HKTV’s chairman is planning legal action, and many pan-democratic and other groups are looking to use a parliamentary maneuver to force the government to come clean on its reasons for denying the license. “The refusal to provide reasons for the refusal to grant a license has raised suspicions that the influence of Mainland China is behind the decision, and that it reflects a desire in Beijing to slowly encroach upon media freedom in Hong Kong in an attempt to bring it in line with the ruling party’s values,” the zdnet.com article stated. Among the protesters at the rally were civil servants, who are normally apolitical, and secondary students. “I am very moved by your conduct. I hope that the union will get an answer. Let me say once again: I support you! Keep your spirits up!” Lau said, bringing a huge cheer from the participants. British singer Kashy Keegan flew in all the way from the United Kingdom to show his support. Famous Hong Kong actor Paul Chun, father of HKTV actor Benji Chiang Man-Kit, recalled how he warned his son when he wanted to enter this field: “You have to work with enthusiasm and work hard with good preparation.” He said that what he taught his son is contrary to what the government is now doing, and criticized the government for giving no explanation for the license denial. 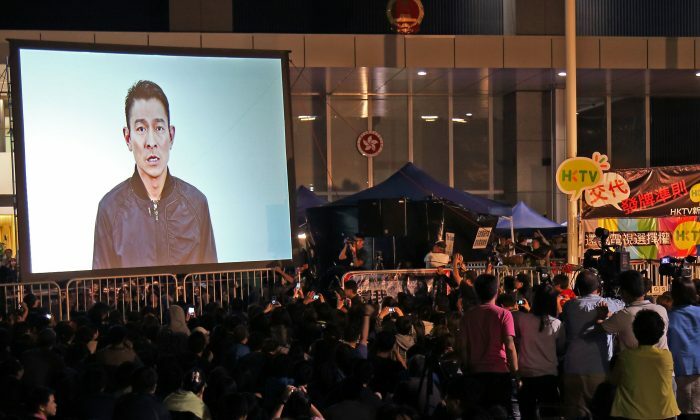 HKTV chairman Ricky Wong Wai-kay has said that he would seek legal redress, and the union, pan-democratic groups, and the pro-business Liberal Party have all appealed to the government to rethink its decision. The staff union gave the government until Oct. 26 to explain the license denial, and the union expressed anger that Chief Executive Leung did not respond, according to South China Morning Post. One government official, Greg So Kam-leung, claimed that he had already explained the government’s decision in a letter to HKTV on Saturday, according to the Post. However, the letter reportedly only stated that “a number of factors had been considered,” the Post added. The government also claimed that it was dealing with “judicial proceedings” and therefore could not offer an explanation, the Post reported. Pan-democratic groups, the Liberal party, and a political fringe group called the People’s Opposition Party have all petitioned the government to change or explain their decision. “Granting three licenses [instead of only two] is the easiest way to defuse this political bomb,” said Liberal leader James Tien Pei-chun according to the Post. Several HKTV staff members remain camped outside the government headquarters, while union chairman Henry Yeung Chi-ho said the union is planning what to do next, the Post reported. The union will return for another rally on Nov. 6, when the Legislative Council will debate the issue. Pan-democratic, Liberal Party, and possibly other legislators will seek to use the “Power and Privilege Ordinance” to force the government to produce documents showing the basis for the license denial. According to Apple Daily, if the Council does not employ the ordinance, netizens will arrange for blocking the entrances of the building. Netizens are also calling for everyone in the city to turn off their TVs in protest on Oct. 30 from 7 to 10 p.m., Apple Daily reported. Translated by Y.K. Lu. Written in English by Sally Appert.